Although, or even because, Belarus is a military ally of Russia, the greatest threat to the country's security is posed by a potential confrontation between NATO and Russia. If East-West conflict were to escalate, Belarus would become a frontline state in the hostilities. 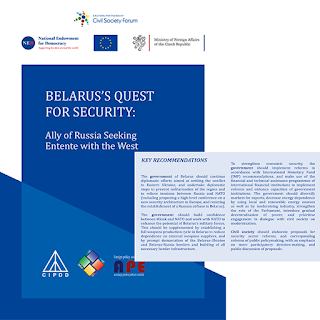 BELARUS’S QUEST FOR SECURITY: Ally of Russia Seeking Entente with the West assesses the internal and external threats facing Belarus’s security, including heightened concerns about escalating regional tensions following the Russia-Ukraine conflict since 2014. 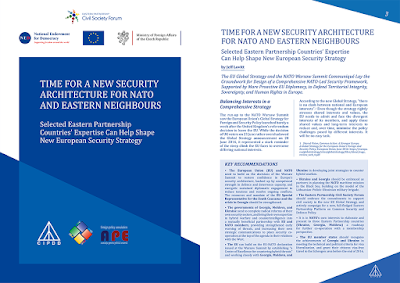 The study by Dzianis Melyantsou is the latest paper to complement the overview study, Security Alert on the EU's Doorstep: Strategies for Strengthening Security in the Eastern Partnership Countries, published by the Caucasus Institute for Peace, Democracy and Development/CIPDD (Georgia) and presented at a roundtable event hosted by the Polish Institute of International Affairs (PISM) in Warsaw on 21 June 2016. • The government of Belarus should continue diplomatic efforts aimed at settling the conflict in Eastern Ukraine, and undertake diplomatic steps to prevent militarisation of the region and to relieve tensions between Russia and NATO (including proposing a high-level conference on a new security architecture in Europe, and resisting the establishment of a Russian airbase in Belarus). • The government should build confidence between Minsk and NATO and work with NATO to enhance the potential of Belarus’s military forces. This should be supplemented by establishing a full weapons production cycle in Belarus to reduce dependence on external weapons suppliers, and by prompt demarcation of the Belarus-Ukraine and Belarus-Russia borders and building of all necessary border infrastructure. • To strengthen economic security, the government should implement reforms in accordance with International Monetary Fund (IMF) recommendations, and make use of the financial and technical assistance programmes of international financial institutions to implement reforms and enhance capacities of government institutions. The government should diversify markets for exports, decrease energy dependence by using local and renewable energy sources as well as by modernising industry, strengthen the role of the Parliament, introduce gradual decentralisation of power, and prioritise engagement in dialogue with civil society on modernisation. • Civil society should elaborate proposals for security sector reforms, and corresponding reforms of public policymaking, with an emphasis on more participatory decision-making, and public discussion of proposals. Dzianis Melyantsou is a research fellow at the Belarusian Institute for Strategic Studies (BISS). The editor of the study was New Diplomacy Chair, Jeff Lovitt.